Maurizio Sarri’s first competitive match in charge of Chelsea ended in defeat as Sergio Aguero reached 201 Manchester City goals. SERGIO AGUERO FINALLY reached 200 goals for Manchester City as his double saw Pep Guardiola’s side overcome Chelsea 2-0 in the Community Shield at Wembley. 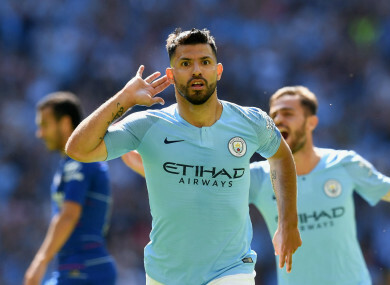 Argentina international Aguero had been stuck on 199 since he notched in the EFL Cup final victory over Arsenal on February 25, but he finally added to his tally in the first half to put Chelsea on the path to defeat in their first competitive match under Maurizio Sarri. The 30-year-old looked sharp and slotted home his second after the restart to ensure the Premier League champions started the new season with silverware. Aguero’s movement enabled him to find gaps in Chelsea’s defence, which has switched to a back four following Antonio Conte’s departure, and served to highlight the Blues’ shortcomings in the final third. Despite the absence of star players like Kevin De Bruyne, Raheem Sterling, Eden Hazard and Thibaut Courtois, the intensity was high in the opening stages. City got on the front foot and took the lead inside 13 minutes when Phil Foden turned up the tempo by driving forward and feeding Aguero, who drifted into space 18 yards from goal and picked out the bottom-right corner. Chelsea did not have their first touch in the opposition box until the 25th minute and the move ended with Alvaro Morata firing high and wide, the Blues struggling to break City down as the pace of the game subsided. A delightful pass around the back of David Luiz from Foden gave Aguero the chance to get his second five minutes after the restart, but Willy Caballero did enough to force him wide and he could only find the side-netting. Aguero was not to be denied eight minutes later, though, as he darted behind David Luiz and placed Bernardo Silva’s neat pass beyond Caballero to put the result beyond doubt. Email “Aguero shines with a double as Man City complete Community Shield triumph”. Feedback on “Aguero shines with a double as Man City complete Community Shield triumph”.